When Germany overran France in 1940 they captured large amounts of equipment and converted some for their own use. 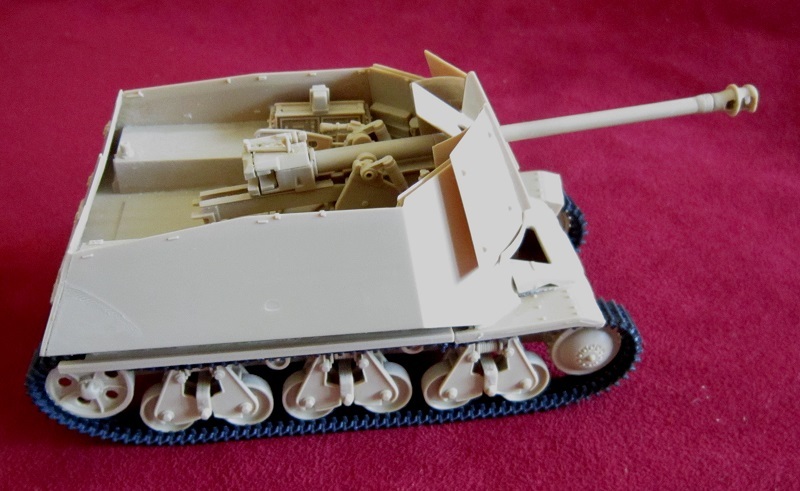 One such vehicle was based on the Hotchkiss H39 with a new superstructure housing the Pak 30/1 7.5cm anti-tank gun and became the Panzerjager 39(H) mit 7.5cm Pak40/1 Marker I. This kit comes in a very sturdy shrink wrapped tray and lid type box.. The vehicle is shown parked with two crewmen looking out of the crew compartment and chatting with 3 passengers seated in a Kubelwagen that is parked behind it. The illustration of these 2 vehicles has been superimposed over a brown and white photo of a field. Both vehicles are in a base of sand with blotches of dark green. The 39(H) just has the German cross for marks on it’s sides. 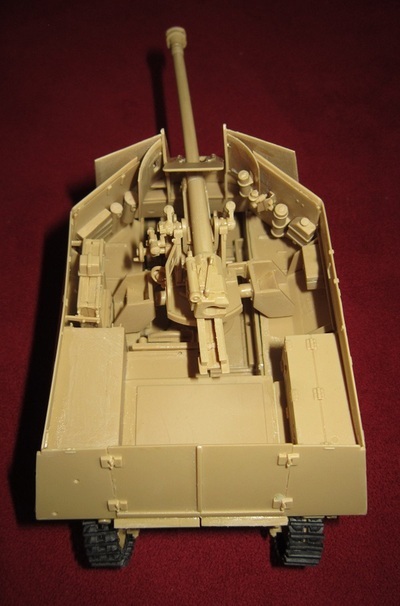 The size of the finished model is said to be 184.3mm in length (7 ¼”), width is 71.56mm (2 ¾”) and height is 71.8mm (about 2 ¾” also). 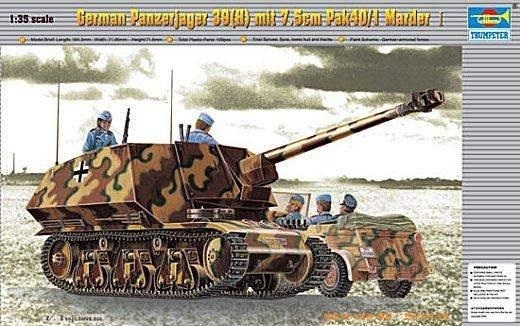 It says there are 199 parts on 5 trees in the kit, the lower hull part, vinyl tracks and paint scheme for German Armored Forces. 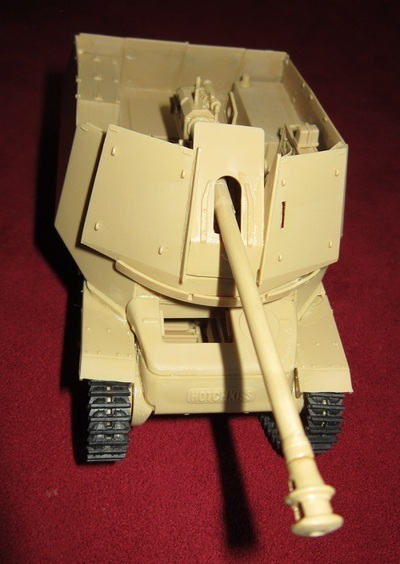 One side panel has a color 2-view (side and top) of the 39(H) in the box art pattern, followed by a one paragraph history of the tank in English and Chinese. The copyright date is 2004 and Trumpeter’s steet address in China is given. The other side panel has 4 color walk-around photos of the model made up in the box art subject scheme. 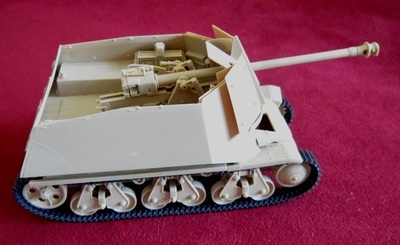 It says the kit is for modelers 14 years and up in age, again in English and Chinese. 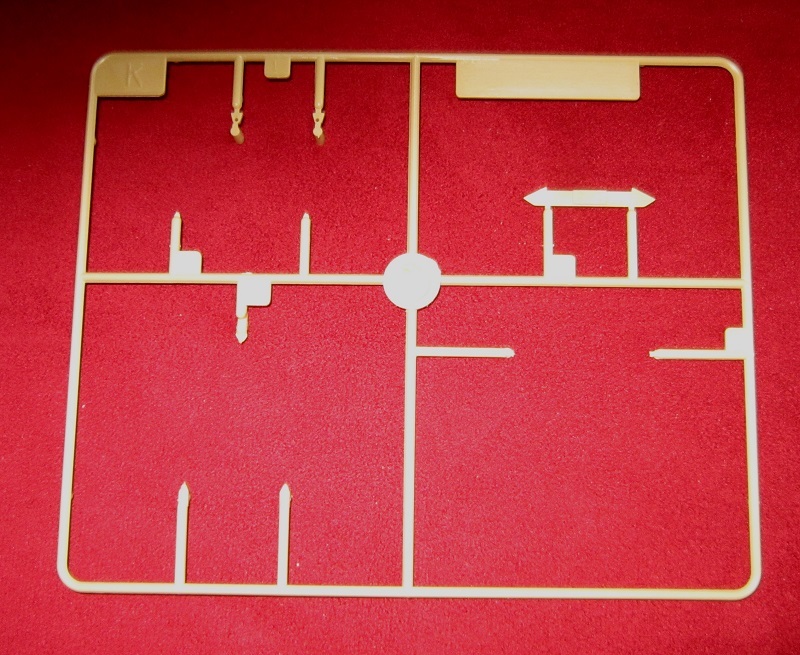 The kit contains 5 tan parts trees, the tan hull tub and black vinyl rubber band type treads. 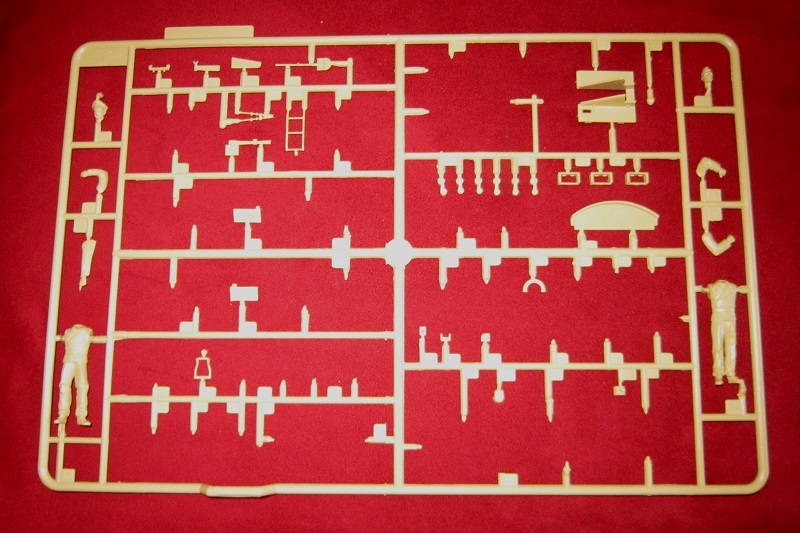 The decal sheet and instructions complete the kit’s contents. The instructions consist of a staple-bound booklet of 12 pages in 8 ½” x 11” page format. Page 1 of the instructions begins with a black and white side profile of the 39(H) followed by “Read before assembly” instructions in the two languages. Bellow this is international assembly symbol explanations and the decal application instructions in the two languages. Page 3 through 11 give a grand total of 20 assembly steps. Page 12 has a 5-view for one scheme in a base of middle-stone with a dark-green and red-brown verticle wave pattern and just German crosses on the sides and rear. No division marks are shown. Gunze Sanyo brand paints are suggested. Tan letter A parts tree holds: road wheels, return rollers, idler wheels, drive sprockets, bogies etc. (94 parts) One part is called out as being excess and not needed to complete the model. The is no letter B, C or D trees. Tan letter E parts tree holds: the hull walls etc. (18 parts) 5 are excess. Tan letter F parts tree holds: the crew figures, tools and internal details etc. (67 parts) the crew figures are divided into full bodies, separate arms and heads. There is no letter G tree. There is no letter I or J parts trees. This is a very nicely detailed kit inside the fighting compartment. Highly recommended. Kit courtesy of my wallet at a very reasonable price.